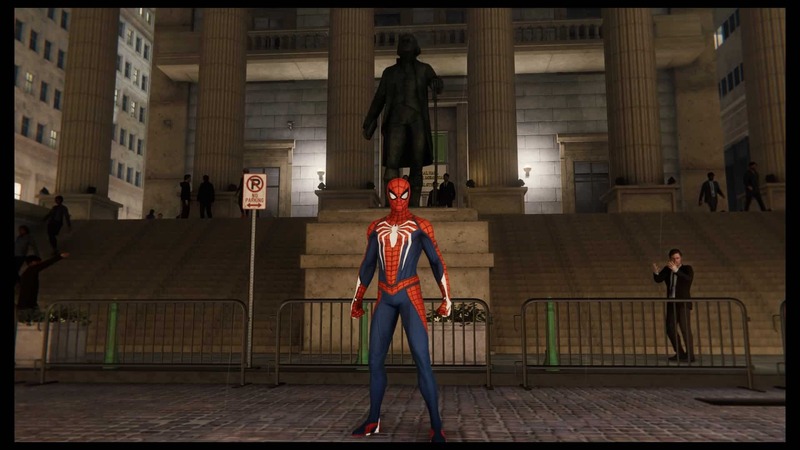 To celebrate the frankly gorgeous depiction of the Big Apple in the new Spider-Man game on PlayStation 4, I decided to let Spidey hit a little of the tourist route, stopping by at some of the most interesting real, and fictional spots, around town. Not even the fact that the city was under heavy militia guard could stop him, nor the fact that Mary-Jane Watson was waiting for him to meet up with her to follow a lead. He’s just that kinda guy, in that kinda open world game. 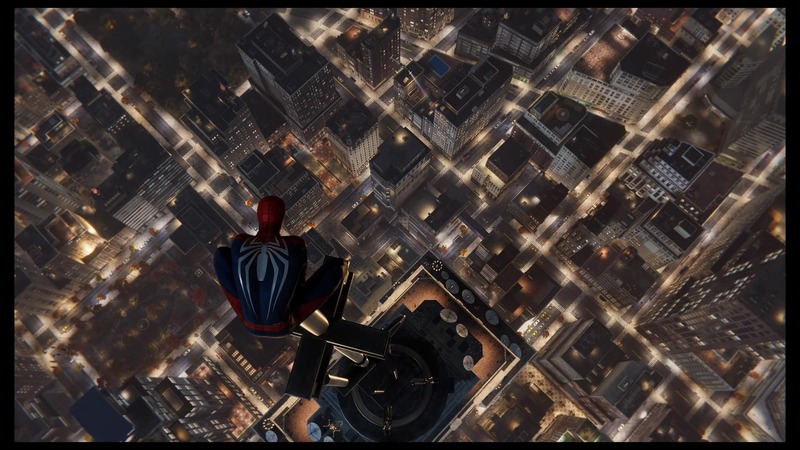 After visiting Wall Street, our favourite Web-Slinger stopped for a moment to ponder it all. Should he be investing in sub-prime mortgages? Or would a Roth 401k provide better diversity for his portfolio? Does he understand what any of these words mean? The answer, dear reader, would be no. 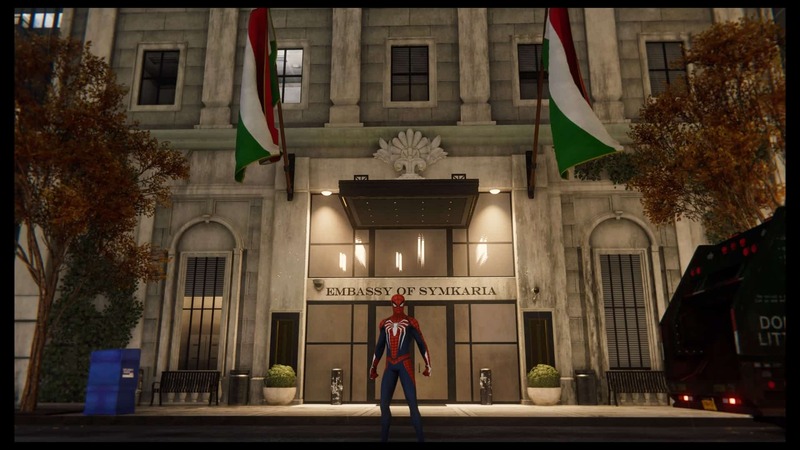 Spidey next decided to take a brief diplomatic tour of various embassies, stopping first at the one for the nation of Symkaria. This nation is fictional within our own universe, but in Spidey’s world, it’s where the fearsome female mercenary, Silver Sable hails from. Close by is the Wakandan Embassy. 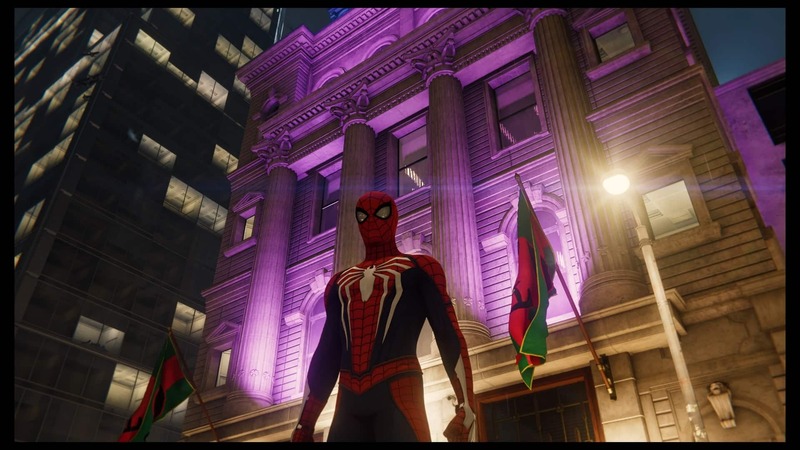 Looking even better at night, there were some very nice touches to appreciate, like the Wakandan flag, and the fact that the whole building is lit up in the same purple as the magic flower that grants Prince T’Challa his superhuman powers as the Black Panther. 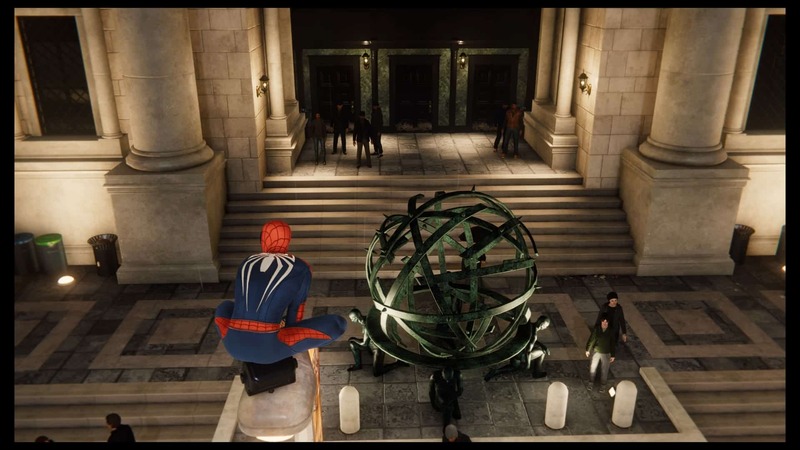 Deciding to publicize yet another Marvel Franchise, while he was in the neighbourhood, Web-Head popped by the Sanctum Sanctorum, the legendary hideout of Doctor Strange, the Sorcerer Supreme. 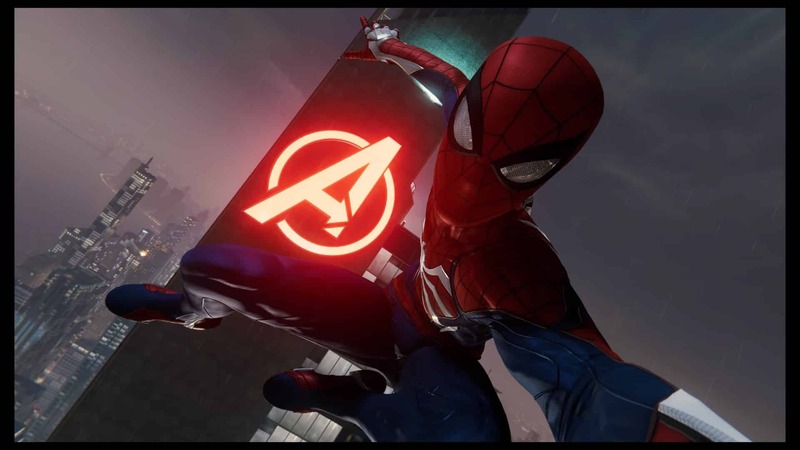 Spidey is here pictured outside the building, taking selfies, after being kicked out for calling Doctor Strange a Hufflepuff. Spider-Man, like so many of us, grew up with a PlayStation 2, and there in 2004 he loved playing Spider-Man 2: The Official Game of the Film. Putting aside all paradoxes that ensued from that statement, what he loved doing most of all was climbing right to the top of the Empire State Building, and plummeting as fast as possible back to street level again. Thankfully dear readers, such pleasures are available again, and in Full HD. New York City is a glitzy place, where showbiz plays a big part of life for the citizens. 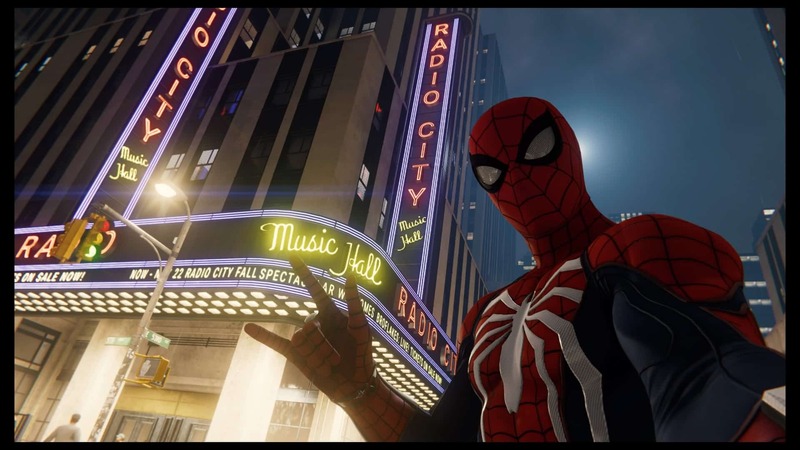 Places like the world famous Radio City Hall, with its iconic lights, are a definite place to stop for a quick snap. Spidey couldn’t believe that he hasn’t been here before now, but you know how it is. You so rarely do the tourist-y things when you live in the city yourself. 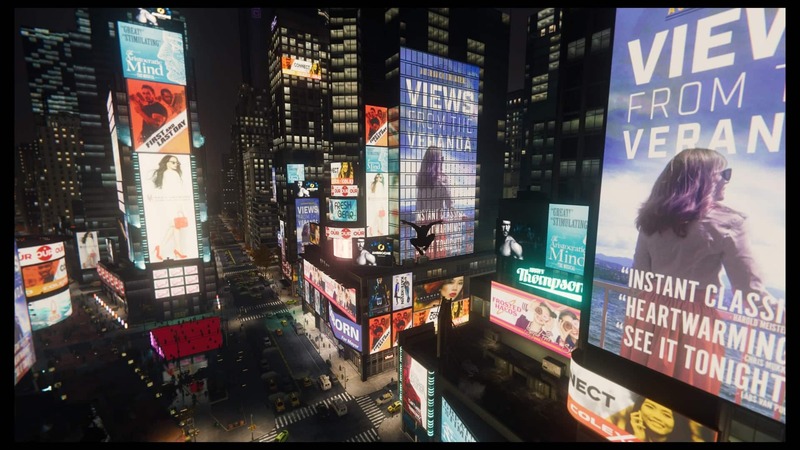 Leaping across to Time’s Square, which looks gorgeous at night, as it does in real life, Spider-Man is illuminated against the bright billboards; a tiny bug against the relentless march of capitalism. Spider-Man was once offered a business card by a nice man named Matt Murdock. Matt was blind, but ran his own partnership law firm with his best friend, Foggy Nelson. Matt told Spidey that if he ever needed help, all he needed to do was swing by Hell’s Kitchen and ask for him. 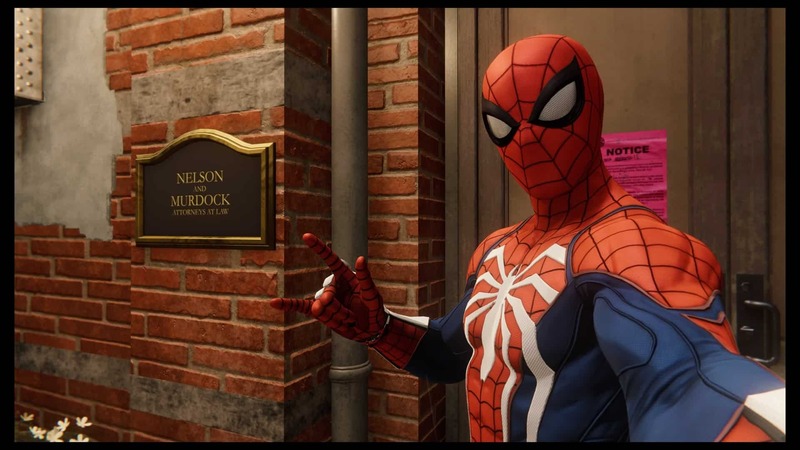 Sadly, when Spidey arrived, he found a pink eviction notice on the door, showing that the duo must have fallen on hard times. Nevertheless, he cheered himself up with a selfie, as one does at these times. Nearby was Alias Investigations, a Private Eye business run by a woman named Jessica Jones. She too had a pink slip on her door, indicating that things were not going well. 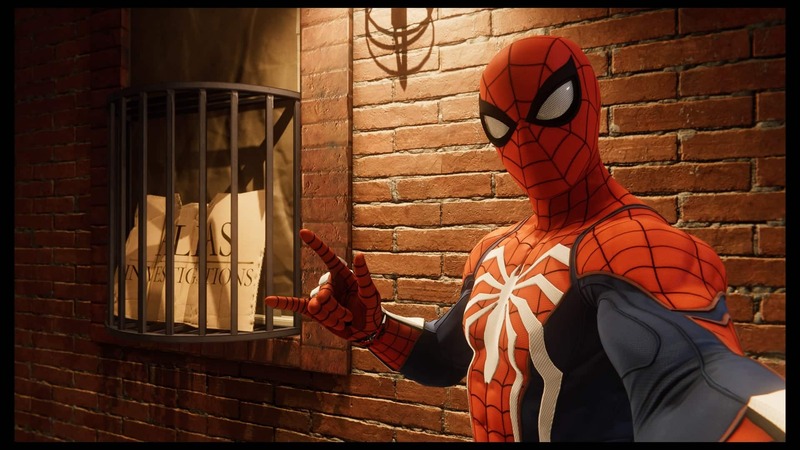 Spidey, in fact, saw a lot of hardship in Hell’s Kitchen, and wondered that it seemed almost like its own little world in there, its own universe, one might say. Whatever was going on there, it was certainly darker and grittier than what was happening in the rest of New York. Spider-Man decided to leave well enough alone, and return to his quips. On the Upper West Side of New York is the Natural History Museum, famed for its setting for the Night At the Museum film series. Spidey hoped that he would see a moving dinosaur, but alas, as he sat there, the young human adult with the powers of a spider gained through an irradiated spider bite who battles crime against various animal-themed villains, he realised that sounded fanciful and ridiculous. The Empire State is not the only tall building in town these days. The Avenger’s Building stands proud and tall amongst the Upper East End. Spidey tried to phone Mr Stark, but neither he nor any of the other Avengers were in when he rang the doorbell. They were probably off doing something more important, like saving Asgard, or being turned into small piles of dust at the time. 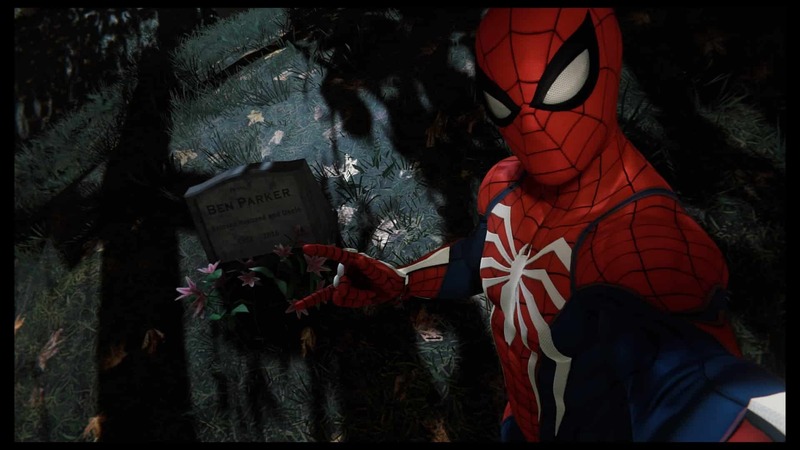 It’s not listed on any map, but Peter always knows where to go if he wants some quiet time with his dear Uncle Ben’s grave. 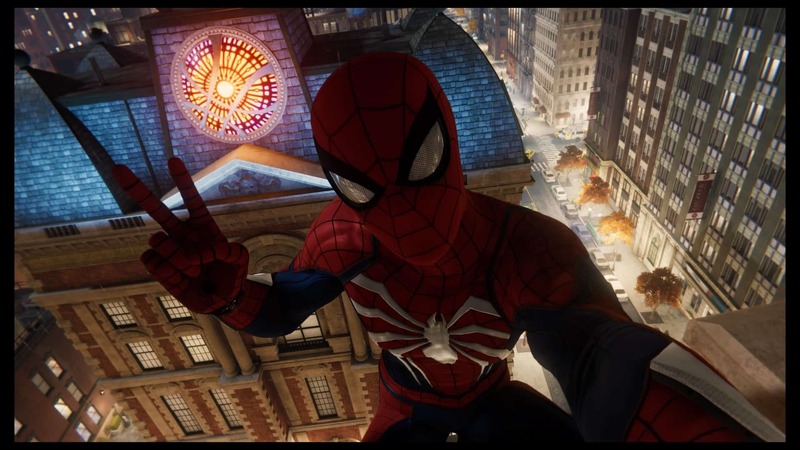 A source of wisdom and inspiration in his life, and with his words being what drives his hero’s journey, Spider-Millenial responded to this dignified, sombre place like most people of his generation, and ended his tour with a selfie and a hashtag.